The FDCVB is compliant with the Bluetooth 3.0, supporting HSP(Headset Profile), HFP (Hands Free Profile) and A2DP (Advance Audio Distribution Profile), suit for most of the Bluetooth device such as smartphone, MP3, GPS and so on. 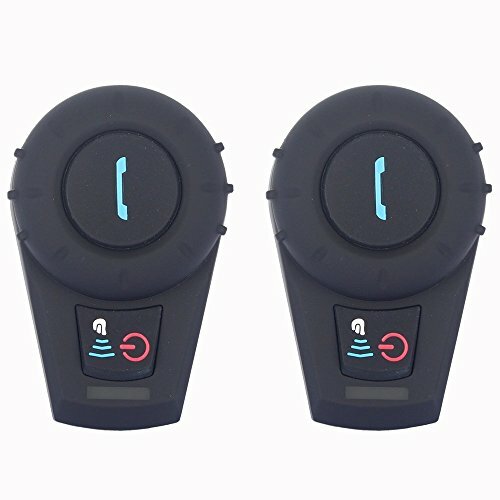 Once it's connected to the mobile phone and GPS, you can have a hands-free call and listen to the voice prompt of GPS easily. Similarly, you can also connect it with mp3 and phone to enjoy your favorite music by controlling music through AVRCP (forward, backward, play, pause). With DSP echo cancellation and noise suppression technology, crystal clear voice quality is available in a high speed. Besides, Audio Multitasking technology allows you to answer a call and have an intercom while simultaneously listening to music or GPS. Auto-receiving calls and last number dialing functions are available too. Support up to 120km/h(75mph) and maximum of 500m(1641 feet) distance, 3 riders pairing and 2 riders intercom at the same time, provide efficient and convenient communications. Wireless bluetooth music receiver and speaker, enjoy streaming music from cell phone or other device through Bluetooth A2DP. Hi-Fi speakers make you enjoy crystal clear voice and music from your cell phone or other device with Bluetooth A2DP. Audio Multitasking technology allows you to answer a call while simultaneously listening to music or GPS. If you have any questions about this product by OHMOTOR, contact us by completing and submitting the form below. If you are looking for a specif part number, please include it with your message.